Newborn baby furniture can be expensive. Second-hand items can save a family a great deal of money. When shopping for these items it is important to evaluate how they were handled. Families with pet allergies should ask the seller if animals lived in the home with the furniture. It is also important to ask if the previous owners smoked in the home as some fabrics will retain the odors and harmful chemicals from smoke. 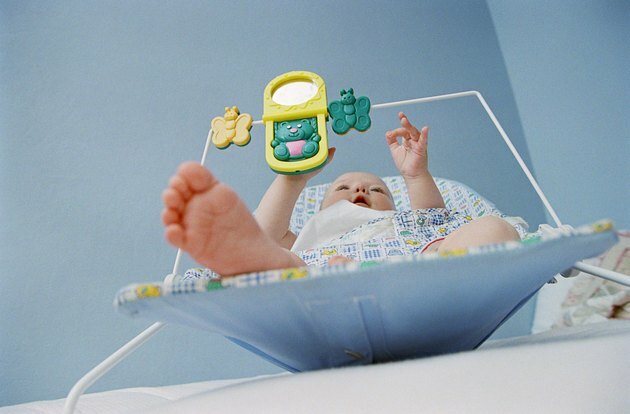 Cleaning used newborn baby furniture is necessary to remove dirt and germs. Remove any part of the furniture that is made of cloth. Review the labels, if available, on how to care for such items. Some fabrics may be tossed in the washing machine while others can only be surface cleaned. Place washable items in the washing machine and use a mild, baby-safe laundry detergent. Line or tumble dry the items before putting them back on the furniture frames. Wipe down all hard surfaces with a soft cloth and disinfecting cleanser. When possible, choose baby-friendly cleaning products that are free of harmful chemicals or aren't hazardous if the baby puts her mouth on the furniture later. When cleaning wood items, use a cleanser that is safe for this type of surface. A small amount of soap and water is usually harmless. Scrub dirt buildup or other stubborn spots with soap, water and a soft-bristled brush to avoid damaging some furniture surfaces including wood. Rinse the furniture thoroughly. If desired spray the items once more with a disinfecting spray and wipe with a dry cloth. Vacuum cloth or upholstered furniture pieces to remove dust mites and other particles. Spot clean fabrics with soap, water and a cloth. Use a fabric spray to remove stains or use an upholstery cleaner or steamer to clean large fabric items. Consult the fabric labels before using any cleaners or steamers. Spray fabrics with an antimicrobial fabric spray if they can't be washed with soap and water. Baking soda makes a good semi-abrasive scrubbing solution when mixed with a small amount of water. Mix four parts of water with one part white vinegar in place of commercial cleaning products. This mixture will also kill germs.